Thousands of people around the globe left their desk job and engaged themselves into Amazon affiliate marketing. Either they chose to be a full-time affiliate marketer or took this opportunity as a passive income source. If you want to join them, this article welcomes you. To make a success with this industry, the thing that can best help you is knowledge (and experience, but that will definitely grow over time once you jump into the work). Keep going on! We’ll try to cover from the basics of Amazon Affiliate to the technical matters as well as tips for success. 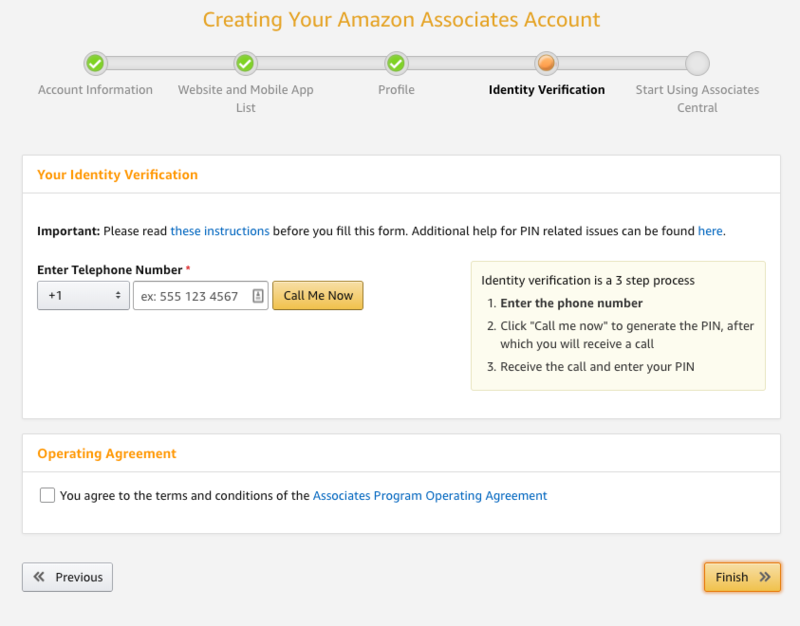 FYI, the affiliate program of Amazon is called Amazon Associates. It’s the world’s biggest and most popular affiliate program. Along with the countless opportunities it brings, Amazon Associates is also the most trusted business for online marketers. Amazon Associates is ubiquitous no matter where you are working from. The policy, especially the commission rate is the same to associates from every corner of the world. Amazon is the home of millions of goods, and any marketer can build their fortune by working with a tiny portion of it. Whether you have a website with multiple categories or a deep down niche, Amazon can satisfy you and myriad of users who visit your site. As thousands of people around the world work with Amazon Associates, you will never feel short of knowledge and information. From fundamental to advanced – you’ll get the answer to all your queries. You’re working with ‘digital watch’ niche, for instance. If people follow one of your links and then buy a lot of stuff besides a watch, what do you think will happen? You’ll get a commission for everything they buy (the cookies remember you for 24 hours). Getting started with Amazon Associates is straightforward that requires not much of technical knowledge. Anyone with a computer and internet connection can make their success. Thousands of affiliate sites will appear in front of you, but you can’t trust them all because often they end up as scams or frauds. Amazon runs its business worldwide having inventories across different countries. Amazon is mostly famous for physical commodities although it also sells digital items on a small scale. It sells the products we need in our daily life. The category ranges from home to hobby, apparels to gardening, and thousands more. Honestly? It depends on you. “The more you inspire to buy, the more you’ll earn”- that’s the basis of any affiliate program. And with Amazon’s vast product range, your opportunities are theoreticaly near to infinity. But, have a look at the Amazon commission structure first. From 0% the commission goes up to 10% and don’t overlook the endless possibilities of this trillion (and bigger) dollar industry. Here, I’m doing a simple calculation for you to give you a hint of your potential income. Amazon offers 7% for handbags, and I assume you’re getting 1k visitors per month. Let’s say, 100 visitors convert, and they make a purchase with the average product price of $100. From 7%, you will earn $700. But wait! What if you have 2k or 4k visitors? What if your conversion rate is 20% with a 10% commission rate? You see, I can’t limit you by saying you’re going to earn “this much” or “that much”. The whole strategy depends on you. When you’re signed up with Amazon Associates, you’ll get affiliate links for all the products available on Amazon. You’ll promote the products via your websites based on the niche. When someone visits Amazon through one of the links you’ve promoted and buy something, you’ll get the commission. To run your business as an Amazon Associate, you must need proper media. It might be a website, a blog, or even a YouTube channel. The sooner you can turn your blog into a users-populated place the faster you’re going to gain success. 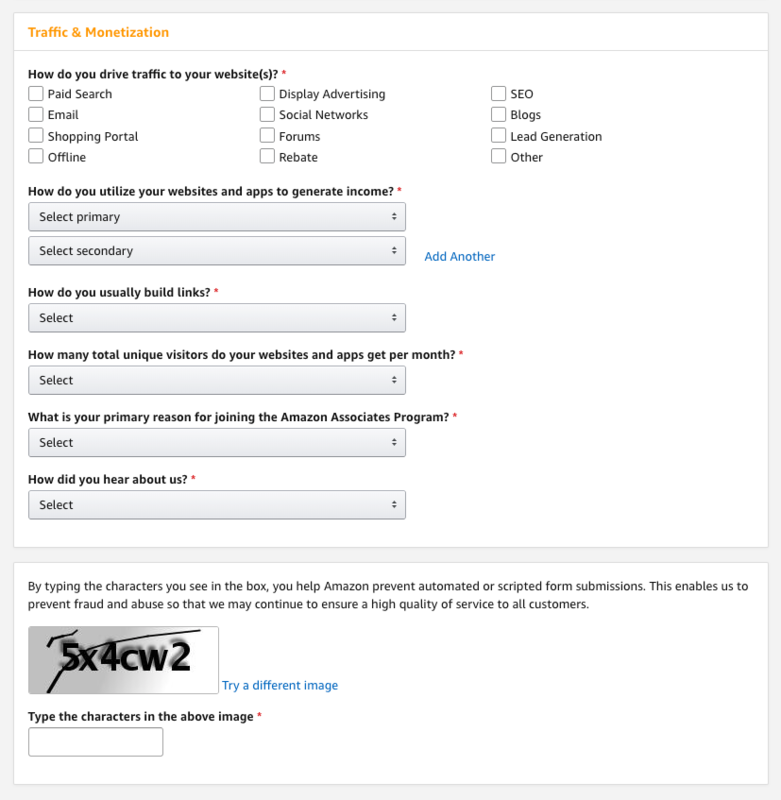 Amazon also consider your site’s quality during the application review process. Keep your goal clear while you’re building the site: who are the target audience, what will be the traffic source, and the purpose of your site. 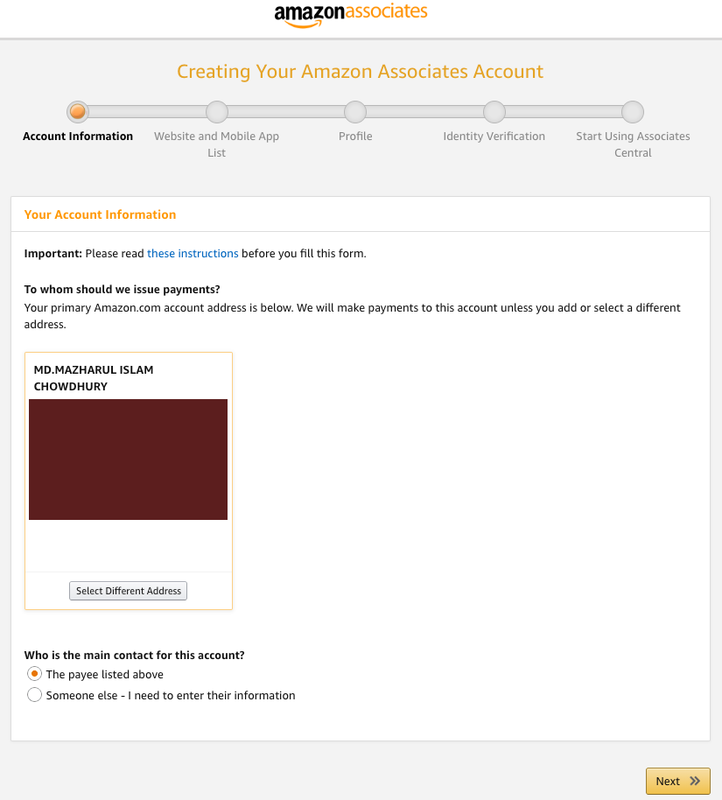 Now, go to the Amazon Associates homepage to create your account. The process is short and painless. You’ve now signed into your Amazon account. You’re about to build your profile very soon. See “Join Now for Free” button? Click it. Fill out the form with your basic information such as your name, address, etc. And, click “Next”. Include your websites, YouTube channels, mobile apps, etc. and click next. Mention your preferred Associates Store ID. It’s similar to your website name. For instance, if your site is mentor.com then the ID would be something like mentor-82 or mentor-50 and so on. Now, tell about your website: who do you make it for, what information are you going to share, and what’s its intention? Choose the topics that depict your websites or channels. How are you willing to drive traffic to your site? Explain this by checking the boxes as SEO, blogs, and more. 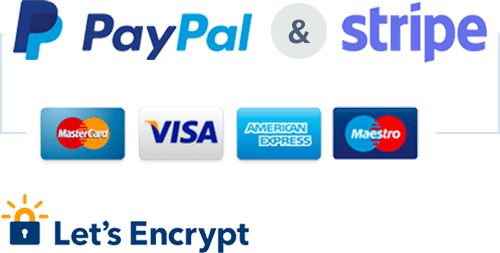 Also, you need to select an option for website monetization source: eBay, Commission Junction, display advertising, and whatever you prefer. 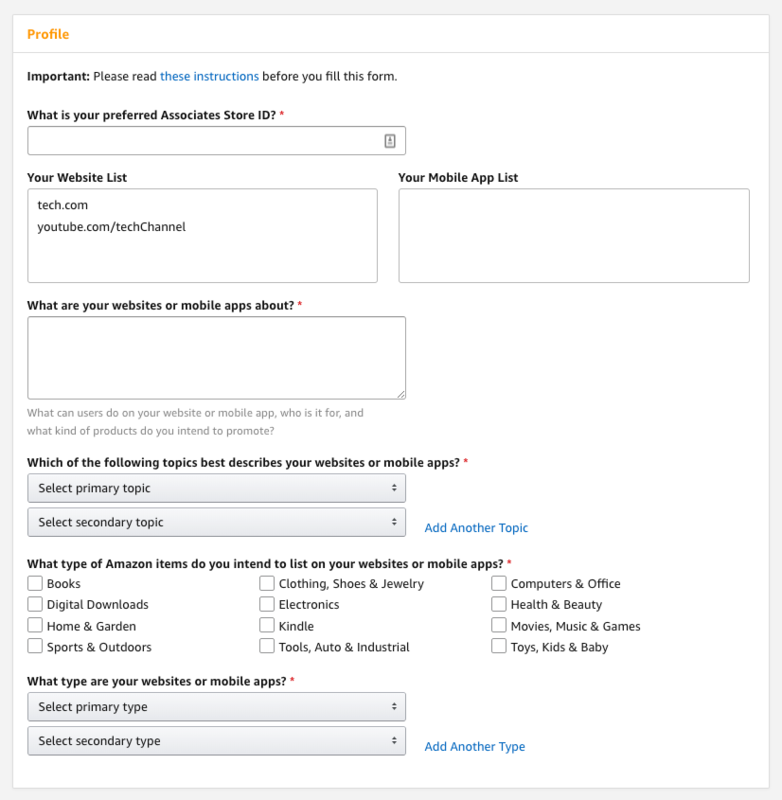 Amazon also wants to know your link building techniques and unique monthly visitors. Give your phone number and press “Call Me Now”. You’ll get a PIN which you have to enter right after receiving the call. Check the TOI box and click the Finish button. The registration will be completed very soon. The process is done. You can enter your payment and tax information now or later. Proceed to your dashboard to explore more exciting things. Here we’ll explain how to get affiliate links for the respective products while you’re going to advertise. In exactly two ways you can do that. The first one is traditional and time-requiring while the latter one is real convenient and easy for all. However, your site need to be in WordPress for the second process although the first method is applicable to all medium. You’ve seen how to create affiliate links from Amazon manually. The process is lengthy, time-consuming, and inconvinient, for sure. Still, if you want to follow the steps, do it. We’d also like to show you another way to create those links effortlessly with a little time (almost no time) spent. If you’re in WordPress, we have very good news for you. There are top-notch, time-saving, and user-friendly Amazon Associates link building plugins available to turn the above-mentioned process into a smoother and more comfortable one. And as these plugins don’t just offer the link building functionality, but a few more handy features, why not use them and reinvent the wheel again and again? I’ll try to leave no stone unturned. In that case, both the good as well as the negative sides of this affiliate program should be discussed. First, the good things about Amazon Associates. If you’re working with any physical niche then Amazon would be the best fit. There are thousands of categories for physical goods. After doing the market research, get started with what you found positive. You can start with the accessories or the products itself. For small initiatives, you can sell computer accessories like mouse, headphones, etc. while laptops can be considered a big niche. Anyway, in this digital era, it’s an effortless matter to find affiliates for digital products and services. But, for physical items, Amazon is undoubtedly the king. Moreover, you won’t find such a big amount of products in one place, especially for affiliates. In the general tendency, people don’t make the purchase right after they landed to the product page. They love to explore different versions of particular products and check out other categories, as well. The more they browse, the higher chance that they will buy more than one product. Amazon will keep track of your customers for 24 hours from their first visit. So, within this time-frame, whatever they buy you’ll earn commission for that. For instance, your site is about baby products. One parent visits your site and goes to Amazon following your link. Then, they bought some beauty products alongside the baby items. Yes, you’ll get a commission for that although you didn’t promote it. And even if they don’t make the purchase within that 24 hours timeframe, but add products to cart, you’ll get paid if they complete the purchase within 90 days of their first visit through your affiliate link. How sweet!! Well, when it comes to conversion, Amazon is almost unbeatable. Sometimes they get past even the industry average. This means you’re in a high-conversion platform with countless under the hood possibilities. If you compare Amazon’s conversion with other platforms, then Amazon wins all the accolades. The most important fact is Amazon’s business is constant or uprising – not fluctuating or getting down. People in Amazon have a Prime task (they actually have premium service called Prime. lol) for converting the traffic into customers. So, it’s your job to send people from your channel, and they’re going to change your way of living. During festive seasons, Amazon and other retailers receive an inundation of traffic which means an extreme rise in sales. And you know, more sales bring more commission. If you could set your blog right, you can make driving a lot of traffic through your media to Amazon. Holidays not only come for general people with good things but they surely reward the affiliate marketers with an infinite revenue. All the people around you are potential customers. Did you know that? What about connecting them and convince them to make shopping using your links? Haha, that’s not the way it works. First of all, you need to establish your own media. It would be a blog, social media, YouTube channels, and more. Your primary job is attracting people with engaging contents. If you’re successful with this challenge, then it’s not hard to get an abundant audience who love to click on your affiliate links. After achieving a loyal audience base, the next step is more significant. But it’s not. Amazon has this excellent option to sell goods using their platform. When you have people coming to sites or media, it’s time to show them a new path where they will find your products. By the way, it’s not necessary you have to manufacture the goods. You can buy the goods from the manufacturers as wholesales and then sell them through Amazon’s store. This program is known as FBA or Fulfillment by Amazon. To touch this opportunity or not is up to you. What we want to deduce is starting with Amazon Associates is entering a whole new world full of excitement, opportunities, and a spectre of possibilities. Although it seems like Amazon is the most compelling affiliate industry to make money with, it has some pitfalls, as well. The commission rate of Amazon Affiliate isn’t always truly modest. It varies across categories. But, it never exceeds 10% which is low if we compare the structure with other affiliate networks. Here’s another serious negative issue of Amazon affiliate. People don’t always buy instantly after going to Amazon following your links. They may wander around and then leave without making any purchase. Think, they came again after two days and bought what they wanted to buy the other day. Nope, what you’re thinking will not happen. You’re not going to get the commission if the purchase is made after more than 24 hours since that user entered Amazon clicking your affiliate link. Also, the cookie gets wiped out right after someone completed the purchase through your link. Now, considering the other channels, they have longer cookie life which helps the affiliates to earn some decent income. So, the 24-hour time limit is a pretty bad thing if you justify the negative aspects. This post doesn’t have that room to talk about success stories with Amazon. We may add a post later by compiling some stories for motivation. However, if you read out the story of Jamie, you will get some inspiration to kick-start right away. He’s now making around $3k per month which is growing everyday. At first, he invested all his effort on writing contents only. Then, he advanced towards building links and other strategy to promote his website. Guest posting, forum conversation, and blog commenting were his early source of getting backlinks. Searching over the internet you’ll get countless success stories that are made with Amazon affiliate. For inspiration, you can start with this post. We also suggest the great compilation of CloudLiving which overall carries a superb value to read and practice. Over the years, people have been attaining massive success with Amazon affiliate marketing. Thus, they surely figured out some basic principles. Google is the primary source of most site traffic, and Google loves fresh contents. If you update your blogs regularly, you’re going to get a higher place on SERPs. New materials are required alongside the excellent and unique contents. A more sensible strategy is choosing a niche that has tons of keyword to work with. After publishing a dozen articles if you got stuck and didn’t find anything to write, then you’re on the wrong track. Including the referral links can be overlooked by your readers. To ensure better visibility and more CTR, we recommend using attractive CTA. Typically, marketers tend to use “buy now” buttons with vivid colors which draw attention. 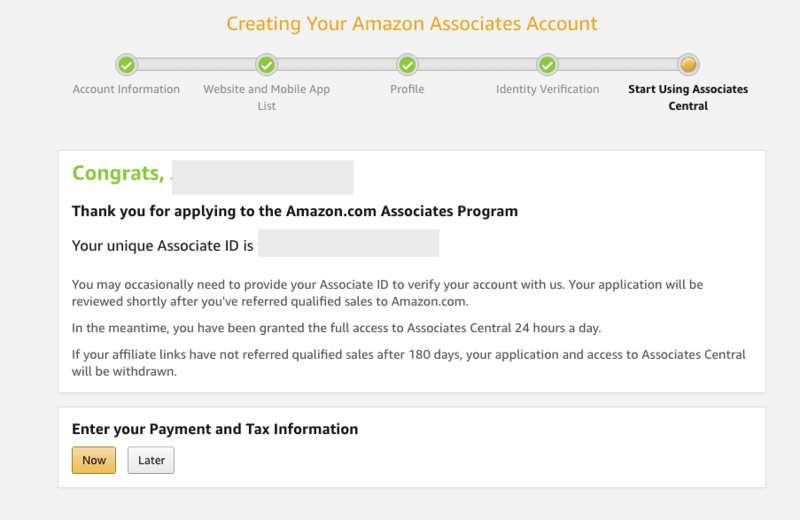 When you’re going to get started with Amazon Associates, it’s mandatory to disclose the affiliates in your site. Amazon suggests to include the exact wording in your disclosure. 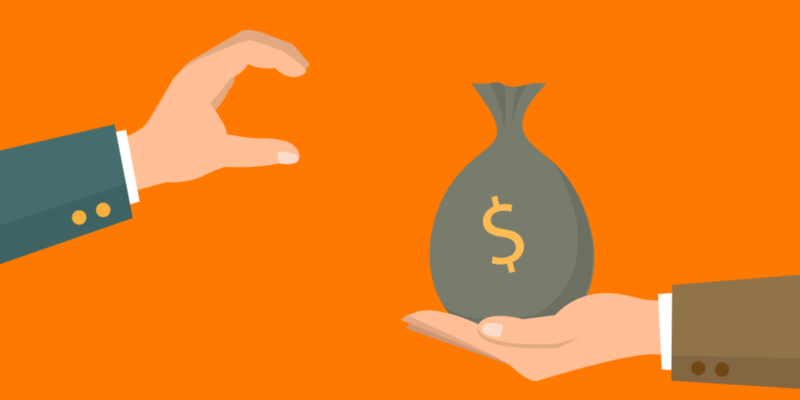 Above all, you should be clear with your promotion to gain user’s trust that you’re going to receive a commission. While you’re in any business, there are some rules to follow. Amazon also has a bad reputation for banning Associates accounts. It’s always better to know what not to do first before even jumping to the business. A little carelessness might cost you big time. You have many other options to include the affiliate links beyond your own blogs. Keep in mind that, you’re only legally allowed to put the links on the site which is listed on Amazon Associates account. Save yourself form sharing the links through email, PDF, close Facebook groups and such other places where login or registration is required. Amazon links are too long, and marketers need to truncate (yeah, that’s a fancy word for “shortening”) them. Don’t ever think about cloaking the links with shorteners like bit.ly or goo.gl, etc. Amazon implies to use their link shortener, and we strongly suggest that also. But for WordPress site owners, link shortening plugins are a good option, which is compatible with Amazon Associates guideline as well. You’ll find various WordPress plugins for this specific purpose. What’s better is, these plugins don’t just shorten Amazon Associate links, but comes with a tons of handy features as well. You can always try plugins like AzonPress, EasyAzon, AAWP and reinvent your whole Amazon Associate business! If you write a round-up post for Amazon products and share it on social media through which people will redirect to your site, that’s not a problem. But if you post a direct affiliate link on a social media post, you can’t pay for this post to promote. Showing the wrong price is a violation of Amazon’s terms and conditions. As you know, the price in Amazon, so it’s a good practice not to share the amount in your site. If you can maintain the update, then there’s no obligation. But, the question is how would you get your website updated especially when there’s a ton of links. Don’t risk to include the price unless you’re able to connect Amazon’s API for an instant update. But the good thing is, Amazon affiliate link plugins like AzonPress can be a good solution for such hassles. As this plugin fetches data from Amazon API, it automatically updates a few information (such as product description, pricing, availability etc) too. So, if you display Amazon products in a sidebar widget, product showcase table or a comparison table using AzonPress-generated Affiliate links, you won’t have to manually update them ever again. The plugin will fetch data from Amazon automatically and if a piece of product information is updated on Amazon, that will be updated in your site as well. We’d like to share some useful, and practical pro tips for success. Later on other posts, we’ll discuss these in details. But, here we suggest you only the ones you may apply in initial stages. As you already know, you first need to go for a niche to start with affiliate marketing. It’s not mandatory but will help you surely to reach the destination sooner. Whether you are going to start your affiliates with electronics or sports items is totally up to you. If you choose a small niche then it might be hard to make money out of it since the industry is already way too competitive. By selecting multiple platforms, you’re spreading the seeds all over the yard. You can hope, some plants you will get for sure even if some can’t live. There are hundreds of ways to promote Amazon Affiliate links, and you’re allowed to use any of them. You can’t just stand up on the road and ask people to follow your links by giving them handbills. What you need is a proper channel that we have mentioned earlier as media. This media could be social media like Facebook and Twitter, video sharing sites like YouTube, or our own website. We recommend establishing a blog site first. Because a blog site can get you a target audience which is going to convert into buyers. Not to mention that, a blog itself can be a precious asset if you’re not making money with Amazon, anyway. Let’s see how you should promote your business with the different type of posts. Here are some ideas and you can extend it with your discretion. There are many ways people create these posts, and we found some general notions of the structure. They get started with the introduction, some necessary information of the product, mini guide, short reviews on several good products with images (usually from Amazon). Many bloggers insert a table with a group of product links at the beginning. Have you ever asked yourself why do people come to the internet? It’s mostly for getting answers for the questions arose in them. They need a solution, and they want to know how to overcome their current situation. So, you got my points? When your blog solves problems, people are going to love it. From the comparison between two or more products, people can reach a determination on certain products. This way, they are more informed about the products and can decide with no stress. Usually, you write these posts comparing two products by discussing their good sides and bad points. People sometimes get stuck between two products. They’re left only with two options after their in-depth research and analysis. And, here you come with your comparison post. These are focused on the user’s intent. You already know, what they are looking for. Now, you are going to help them with informative contents that solve their problems. In most cases, users choose one from the couple. What we would like to mention is comparison posts have low competition and high buyer intent. Because of the low search volume, you might avoid these categories for not using very often. Many popular blogs follow this style where listicles get the utmost concern. Even search engines seem to give priority for list type posts. Although they are similar to roundup posts but slightly different from them. Listicles generally contain a list of products with small descriptions to all. Thinking about the value, they actually help users with a variety of suggestions. Also, keep in mind that these articles may be counted as thin contents. For the small and new sites, it’s safe to go with the round-up articles in a significant number. Mixing up the different type of posts can be a profitable solution for the beginners. Without some tools, your progress would become stagnant. In today’s world, success requires fast action. This is an excellent tool regarding keyword research and competitor analysis. It’s believed that Ahrefs link database is one of the humongous collections of the world. Before starting a new project, do basic research to find profitable keywords. Another great use of Ahrefs is understanding competitors strength. If you know what your contenders are doing and how they are doing before even the battle got started, you can consider yourself standing ahead of them. You have to pay a decent amount for this plugin, but trust me, it’s worth your money. If you do the cost-efficiency analysis, Ahrefs will provide you satisfactory result. Over the last few years, WordPress has become a considerable dependency for bloggers and affiliate marketers. The popularity of WordPress has been growing since its birth, and there’s no sign of declining its reputation. 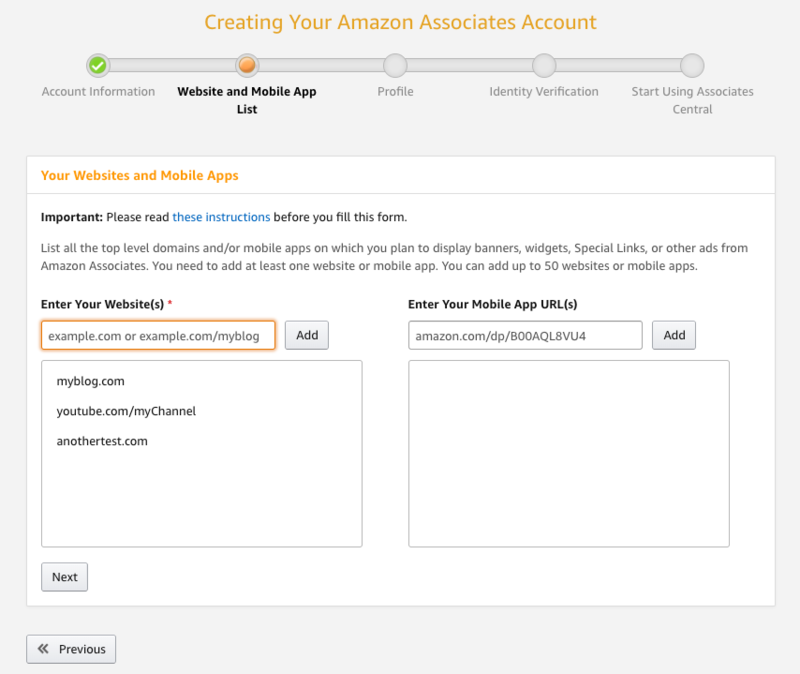 Getting started with Amazon Associates, a blog is a must. And, without WordPress, you’ll merely lag behind the current pace. For better output and faster improvement, join this platform. Another good reason to connect this network is its enlarging community. Monitoring your site’s growth and performance is mandatory. Using Google’s free tool, you can get all the data from your site’s activities. Which pages are working best, from where the audience is coming from, how people from mobile devices behave – you can achieve all these information with Analytics. This is another free yet highly recommended research tool. You’ll find this tool under Google Ads. If you’re starting your business, this tool can be your best friend for finding potential keywords and doing in-depth research. Grammarly has both free and premium version although the free version has severe limitations. However, to ensure the quality of your blog post and to check plagiarism, Grammarly can help you big time. Making product lists and comparison lists are nettlesome and time-consuming. You can handle this issue smartly if you use any product which comes to resolves this issue mainly. AzonPress is built to save your time while you need to create product lists from Amazon with your affiliate links. From now, rest assured on AzonPress Amazon Affiliate Plugin. Can you imagine a blog post with no image at all? But, you can’t possibly afford a graphic designer at the beginning. Besides that, for blogging purpose, you can’t run smoothly without taking any help from a designer. To complete the small design-related tasks, learn how to use the tools. Don’t get scared. I’m not asking for using Photoshop! Use Canva. It’s a free tool with millions of elements and easy to use interface. Search Engine Optimization is a key role player in terms of earning quality traffic. Without the target audience related to your niche, you can’t go forward. In other words, your affiliate success largely depends on SEO. On a side note, don’t get too serious with SEO. I mean, you don’t have to be a master of SEO. 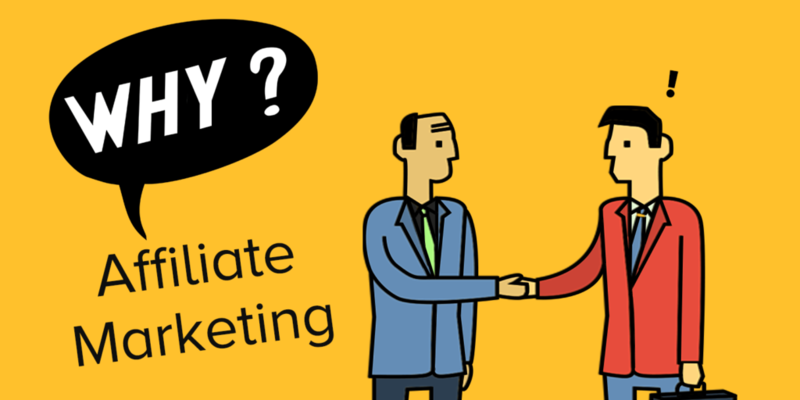 You need the basic understanding which you can implement in your affiliate promotion. There’s no harm to learn the details though. Here, we’ll try to briefly mention some cardinal points so that your efforts don’t go futile. For a starter, SEO primarily can be divided into two broad groups: on-page and off-page. The on-site optimization occurs inside the website, and it’s crucial to keep your site in good health. Similarly, you have always to take care of your site’s on-page status. By doing so, Google and other search engines will find your site entirely up to the standard. Not only the proper on-page optimization helps not getting flagged, but it boosts the site’s performance, as well. Insert your focus keyword into prominent places like post title, headings, and URL. Also mention the main keyword in the first paragraph, inside the content, and the last part. Internal linking for the same category is an authoritative ranking booster. For outbound links, try to give it to the authority sites and non-competitors. If it’s necessary to add links for your competitors make sure they are “nofollow”. Don’t forget to include focus keyword and related keywords to the meta description. Building fresh and high-quality content is a pre-requisite for getting succeeded with Amazon affiliate marketing. Google loves the sites that satisfy the visitors with rich, quality, problem-solving, and informative contents. So, there’s no way to deviate from creating scrupulous content if your goal is to sustain for long in the market. Only make contents that answer the questions arise in your customer’s life. Remember, thin and fluffy contents means you’re about to die (I mean, your site. Don’t be serious). Whatever the length, try to keep it above 800+ words. The longer it is, the higher your chance is climbing to the top. And, more extended contents give you an opportunity of incorporating more keywords with a set of variations. This is another pivotal ranking factor to push your site towards a higher position in SERPs. When high-authority sites endorse you Google consider it as a strong recommendation from the upper class. The consequence is pretty sweet. More quality backlinks mean more ranking and higher reputation. Relevance is another crucial thing to take care meticulously during link building. Links should be relevant and natural. Encourage your audience to share your blog posts by building user-centric contents and adding social sharing buttons. How good a website is depends on that site’s appearance on mobile devices. A wise blogger of today doesn’t rely only on desktop traffic. As the number of people visiting from mobile devices is crazily expanding, it’s time to look at this platform. Even Google shows different search results on mobile browsers. If your site isn’t correctly responsive, you’re losing some vital traffic. Don’t take a risk because the market is way too competitive than one might imagine. Our best suggestion is to use a high-performance WordPress theme. Is your site slow? Don’t be late to address this issue right now. First, check out the site speed with a tool available online. Even Google has a speed checker tool. 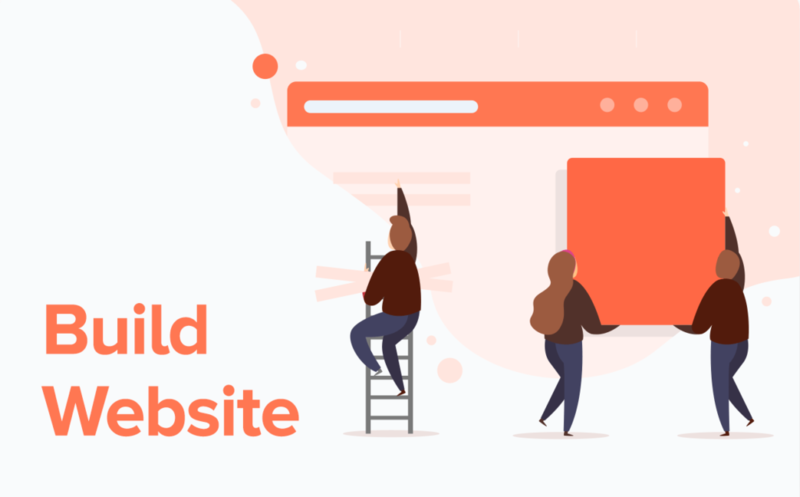 Find out what’s wrong with the site and then start fixing them. As Amazon is the largest retailer with the biggest affiliate network, you must have heard stories around it. Well, not all of these are true. There are some myths circulating around you and they simply don’t mean to be followed. We can’t afford to tell all of them here. Let’s get to know the most repeated gossips along with the truth. Have you heard enough tales before regarding Amazon? 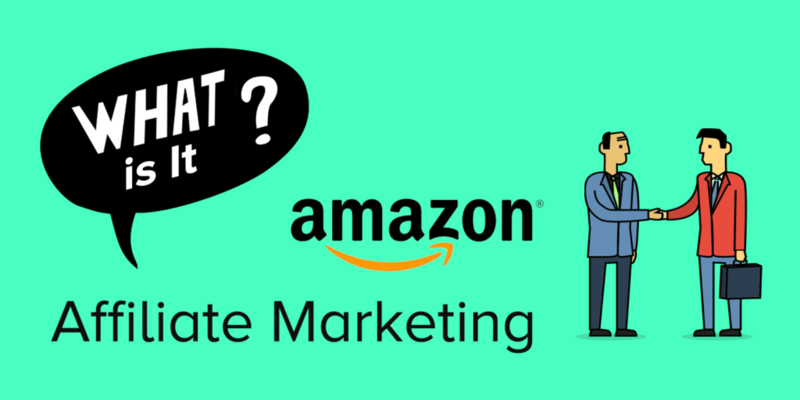 This is so far the biggest myth you have ever heard regarding Amazon affiliate marketing, we guess. First of all, Amazon has an only 24-hour cookie which doesn’t even work out if the customer instantly completed the purchase. Suppose, you have a customer who went to Amazon, added a product to the cart, and left without checking out. Now he’s activated an option for 90-day completion. That means if he comes again within 90 days and completes the order, you will still receive the commission. Well, this not the cookie. It’s a special link. If it would work that easy, then everyone would practice it and Amazon wouldn’t keep the 24-hour cookie. To be honest, all of the successful affiliate marketers get their major traffic from Google. If Google hates the affiliate sites then how people got succeeded with their blogs. Google loves quality sites. If you build your site following the basic SEO rules and don’t violate any principle that Google set up to maintain, you’re walking the right path, for sure. Without a very specific niche, you can make your way toward success. Many of them did. Working with a particular niche can give you some advantages while you want to concentrate on one thing. Moreover, Google can quickly identify this kind of site to rank for which is strenuous in this age of competition. Making success with Amazon affiliate marketing requires a good combination of thorough market research, robust content building strategy, and patience. You can’t win it in a day or a week but you’ll surely win if you’re after it. Choosing the low-competition and a broader niche can help you win the battle before even started. In your whole way, you always have to take care of your media where you’re going to promote the affiliates. Also, using the right tools can save your time and effort and elevate your process so that you can accomplish more tasks within a shorter time period. Thanks for the kind words. It inspired us a lot. “Great post, I agree with you, there is a lot of earning potential in the amazon affiliate program. Thanks for your appreciation, Harish! It’s really cool that you still think to be a full-time Amazon affiliate marketer but remember doers are better than thinkers. So, start your journey ASAP to get the maximum benefit from it.